This award was long past due for Mary Elizabeth, considering her tireless work for this organization. The Dallas Oracle Users Group is one of the largest, most active groups in the country, based in part to Mary Elizabeth’s organizational skills. 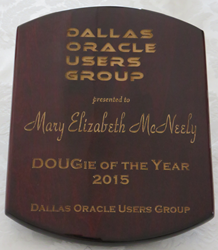 Mary Elizabeth McNeely, President of McNeely Technology Solutions, was presented the DOUGie of the Year award by the Dallas Oracle Users Group (DOUG), at their spring party, for many years of volunteer service to DOUG. Ms. McNeely served as president of DOUG for four years, served on the board for an additional two years and has led various committees since joining the organization in 2004. “It is a special honor to receive the DOUGie award,” commented Mary Elizabeth McNeely. “I joined DOUG in 2004 and jumped right into volunteer work. There are many opportunities to volunteer in Dallas, but I believe in supporting the Oracle community and enhancing the professionalism of all Oracle professionals.” In her role as president, Ms. McNeely led the 300-member non-profit organization in governance, fiscal perspective, publicity and member service. She proposed and negotiated yearly budgets; and oversaw more than 20 volunteers who maintained the website; planned and held 30 technical training meetings a year; procured sponsorship dollars; organized two large social mixers/dinners per year; and performed marketing and outreach functions. In addition, she oversaw the board of directors, preparing meeting materials and guiding the board through the organizational decision making process. The Dallas Oracle Users Group (DOUG) is a forum for sharing information about Oracle Corporation’s database server, application development products, and E-Business Suite. DOUG is a 501c(6) non-profit organization that was formed to meet the needs of the Oracle user community in the greater Dallas area. The organization helps members increase their skills through education, information and networking. All members join a network of peers for collaboration and information exchange about Oracle products and services. DOUG meets monthly, hosting networking events, Oracle study groups, and several technical training forums.